Keetmanshoop is rightly famous for its fine German fare and as a gateway to the Kgalagadi Transfrontier Park. It is also a springboard from which to explore the wonders of the Quiver Tree forest and Mesosaurus Fossil site about 40km away. This incredible two-in-one attraction is too far from your accommodation in Windhoek for a daytrip. However, it’s worth a visit if you are on your way to the Kgalagadi or have planned a stay in Keetmanshoop as part of your Namibian experience. There are 3 ways to enjoy your time at this enigmatic place. 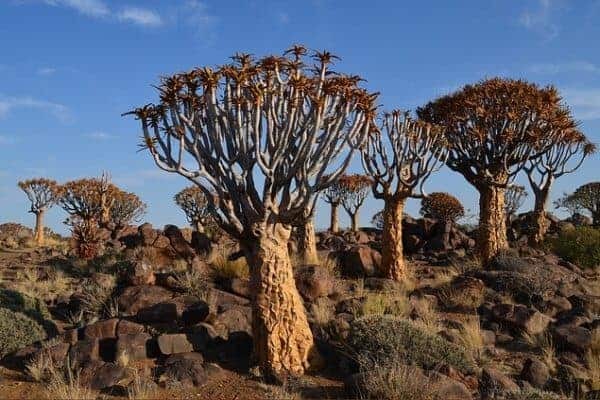 On a guided hike, the charming Giel Steenkamp will fill you in on all the details about these amazing trees. He’ll also tell you how his son, who was then 10 years old, found some strange looking impressions on the rocks here. Further investigation revealed that these designs are all that’s left of the mesosaurus which occurred here 250 million years ago. These miniature crocodile-like creatures with their long snouts and teeth provide important evidence to support the theory of continental drift. The only other similar fossils are found in South America, which suggest that the two main lands were once a single chunk of rock. Steenkamp will also show you the German Schutztruppen graves. Here two German Shutztruppers (the official name of the colonial troops in the African territories of the 19th century) lie in eternal rest overlooking this unique forest. They met their end in the historic battle between the German forces and the local Nama people. You’ll enjoy an introduction to authentic Namibian rock music courtesy of Mr. Steenkamp. His repertoire consists of only two songs – Frere Jacques and iNkosi sikelele Afrika but it’s the performance that is impressive. He hammers out these tunes on a granite rock face, using a stick. It’s an amusing and entertaining end to your tour. Another great aspect of this property is the overnight accommodation offered in simple, rustic chalets in this magical environment. If you are driving from South Africa to your accommodation in Windhoek, the Mesosaurus Fossil Bush Camp is a great place for an overnight stop, just 5 hours from the capital. Start planning your adventures now.